I headed back to Tucson from eastern AZ yesterday. It was a wonderful blue sky day with the temperature in the low 60's. Just the kind of weather for a hike. 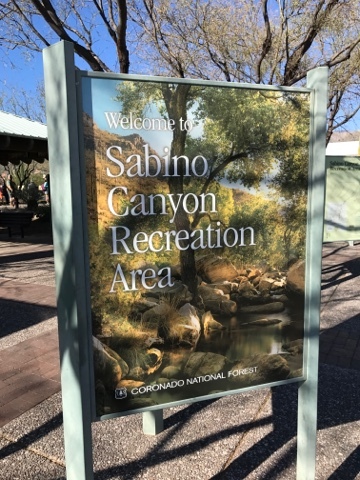 Since I haven't taken a long hike with my full pack, I decided it was the day to do that and that I would hike Sabino Canyon. 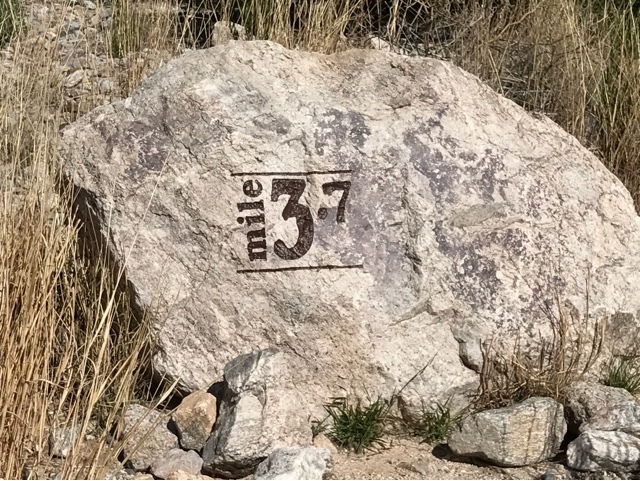 My plan was just for a distance hike with the weight of the pack, so I hiked the tram road that provides an even flat surface. This is the road that a tram takes people to and from the far end of this beautiful canyon to the visitors center. 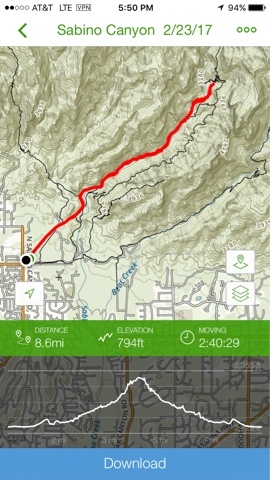 At 8.6 miles this is one of my longest hikes and with a full pack. The elevation was modest at about 800 feet. I was gone for 4 hours although my moving time was only 2 hours 40 minutes, spending extra time crossing water. There are 7 water crossings on this road. All were wet except one. The highest water level was to my calf, so hiking boots alone will get filled with water. It was a real pain to stop and take off pack, take off hiking boots and put on water shoes, walk through the water and take off water shoes, then put socks and hiking boots on again. This took way too much time. Experienced hikers used white trash bags with drawstrings. They put their feet with hikers on and put them in the bags and used the drawstrings to hold the bags up as they walked through the water. For me I got lots of bending and stooping to take footwear off and on so many times. Not the best use of time. 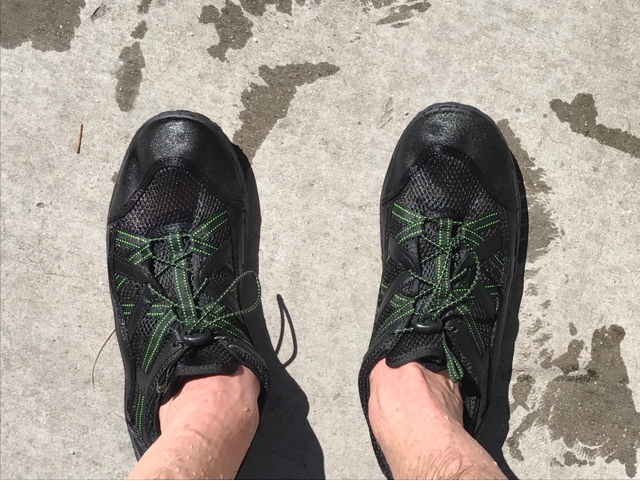 This was more than enough practice using the water shoes, but I needed some practice for by backcountry hike where I will be crossing the streams. I had another problem too. 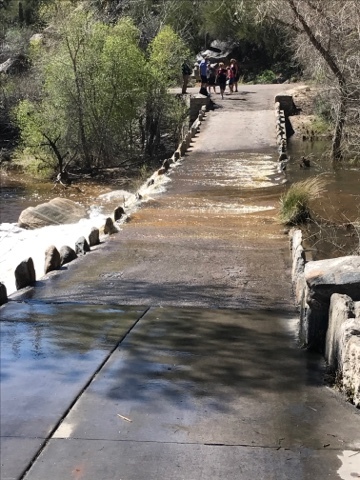 I forgot my towel to dry my feet between water crossings and putting socks back on, so my socks got very wet when this wasn't my goal. The tram road is 3.7 miles each way, but I hiked 8.6 as I started my hike and had to return to the car. I didn't set up the power to fridge in my car as I like to have it run for such a lengthy hike. My mistake with my fridge was I was charging my LiFePo4 battery as I drove the two hours from eastern AZ to Tucson. While I was doing this I plugged the fridge in the Prius 12 volt battery so the LiFePo4 battery would fully charge without a load on it. When I left the car the first time I shut off the LiFePo4 charger but didn't move the power back to the LiFePo4 battery for my hike. The mistake came to me well away from the car and I walked back and included this distance in my total distance. Although I had a a number of mistakes I did find out I need to bring a towel and keep it handy for drying my feet. I also found that the water shoes hold water and I slid one on each side of the bag where I have my water bottles. The problem was that the wet shoes leaked through the sides of the bag and got contents wet. Note to self - don't do that again. I need clips for the back of the backpack to hang them after use. A large trash bag inside your backpack main compartment will ensure that your contents will stay dry. I haven't found any pack with 100% waterproofness yet unless they were made from a dry bag to begin with and outside pack rain covers aren't 100% either. I'm home now and enjoying catching up on all your posts. I'm glad to hear your home safe. I'm back from my hike and I took your suggestion about plastic bags and decided to use 1 Qt and 1 Gal ziploc bags and white kitchen bags to protect the things I need to from getting wet. We did have a couple showers overnight the first night. I had my tent so my backpack was inside with me, but the ziploc bags provided protecting from condensation moisture in the tent too. I am now back so newboosts about my hike will be coming out tomorrow.